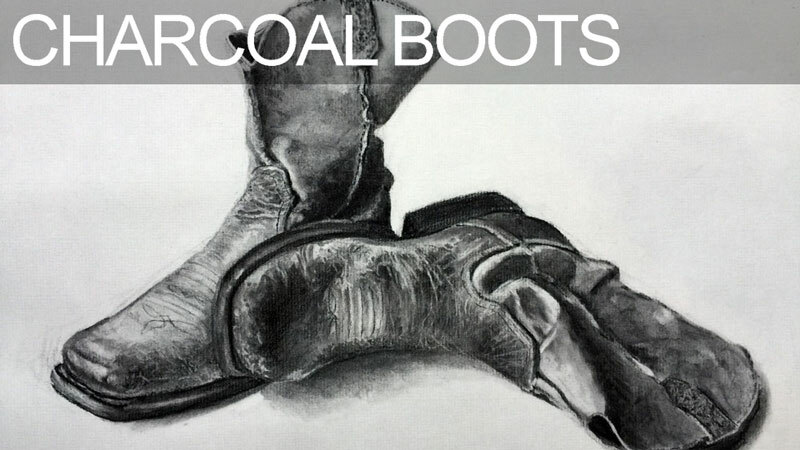 Learn how to draw a still life of boots in this five-part series of recorded Live Lessons. Various charcoal drawing techniques are explored as the drawing is developed. Learn how to blend and apply charcoal in various forms with a level of control and precision. Every step of the process is explained and demonstrated. Five lessons, each one hour long. I love what you are doing with the boot. Don’t let the charcoal get to you. You are helping us see how to use those erasers. I have never used those other erasers or brushes. I have used the Kneaded eraser, but not those other ones. I usually go from light to dark when I am doing black and white. However, because I am self taught somewhat I am seeing another way to approach black and white. Also i have tried to stay away from all mediums but graphite now I won’t be apprehensive about doing charcoal or pastels anymore. I might even go back to painting! Where do you get the charcoal pencil you use, the one that the paper peals off? You can pick one up at most art stores.